I have become increasingly comfortable with being single, unattached, divorced, and free. I am not in a rush to be with someone exclusively. I am actually enjoying the freedom, the ability to choose my destiny. The road ahead is mysterious, scary even but it invigorates me. The adventure of new experiences or the potential for new experiences fills my world with a brand new excitement that I have not felt in a very long time. I miss the comfort of my ex and I will admit that my birthday weekend had me really sad. I wanted to be with him desperately. I wanted him to take me out like we have done for my birthday for the previous twelve years. I wanted him to hold my hand, to make love to me, to hold me long into the night but I know it would have been all wrong. There's just no way that my heart can handle that. Even though he offered to take me out, there was no way I could have done that without feeling all kinds of sadness the next day. It would get in the way of my healing and I cannot turn back now. I have come too far to go back to that place of loving him. Even though we had some really good years, I think we just grew apart wanting different things from life. I could never be the one to leave. I only know how to be loyal and committed. I am truly a woman of my word. If I said, "Til Death Do Us Part," I really meant it. But he decided to leave and I can only respect him for his courage to make the changes that he saw fit. I know I never want to live under the gloom that was taking over our marriage. I never want to feel that dead inside again and I am sure he was feeling that way also. At the same time, I had a deep love for him and he will always own that piece of my heart. Life truly is a collection of experiences. Though he was not my first love, he is and will always be a significant character in the story of my life. I was having a discussion with a friend. We were discussing first love. Every person has that one. My first love was everything that you would expect. He was pure love, animal attraction, physical satisfaction, and yet was also pure hurt. We compared the emotions of our experiences with our first loves and our reactions are identical - that we would run back to them in a heartbeat just to feel that rush again. Why is it that we want to run back to that comfortable place of first love? Both she and I were similar in that we loved them with complete abandon. We gave our whole heart to them. What I experienced with my first love is that as shy as I was, he was patient with me. We explored our emotions and our physical desires together. He cradled my heart and my body like no one ever has. Even now as a 42 year old woman, I have only ever been fully satisfied with him and not just sexually. He knew my body and could take me to the heights of pleasure but even deeper than that, he appreciated my heart, and was absolutely in love with my mind. First love is supposed to be like that - a collection of brand new experiences that we brave together. We wish beyond all wishes that we could take back the heartache that came with first love. It could not have been first love without the heart break. My first love will always own that title of "first love" because he broke my heart, because him leaving cut me the deepest. And my foolish heart was so naive to think that he could love me in my totality forever. And yet, I look back at the fierceness of my love and the strength that I loved him with and I am in awe at my capacity to love him. When we parted ways, I did find love again but a part of me will always belong to him. That place in my heart that was reserved for only him is still locked away never to be experienced by anyone but him. 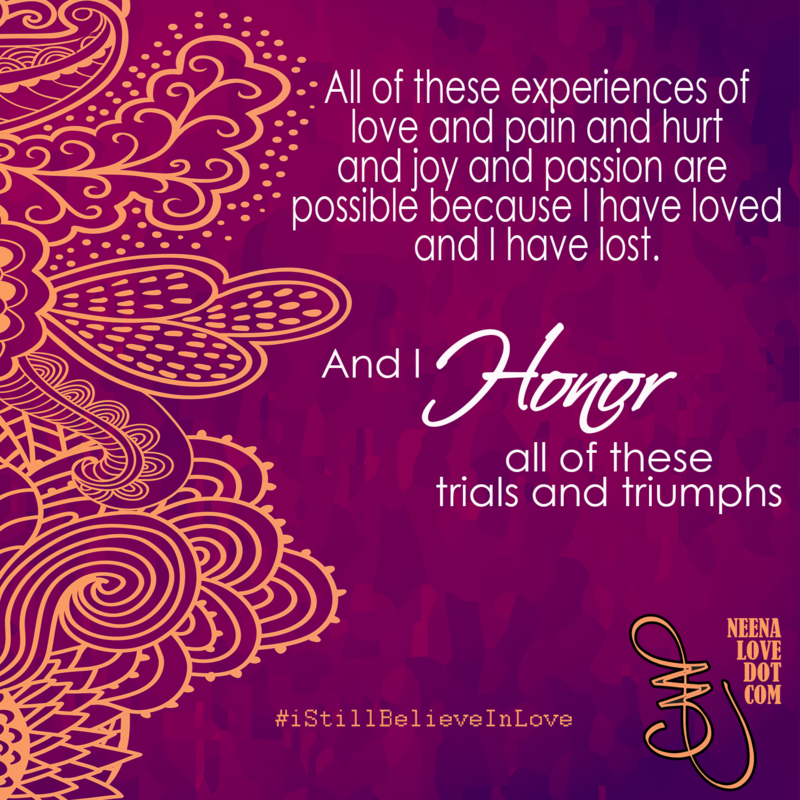 The woman I have become since I split from my first love, I could never be her without having experienced that hurt. I honor that event and all the years since we split because it has added so many facets to my womanhood. My kindness, my compassion, and my capacity to love has only increased because I know what a broken heart feels like. And though I wish that our love had never stopped, I am also grateful that I found love again. And even though that second love has left me, I know I will experience love again and fall truly, madly, deeply in love with another. 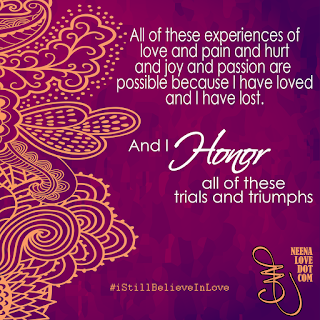 All of these experiences of love and pain and hurt and joy and passion are possible because I have loved and I have lost. And I honor all of these trials and triumphs.